Evelina Alarcon is a Southern California activist and Communist Party USA member. She is the sister of Richard Alarcon. The organization posted a list of significant “Chicano movement” activists on its website which included Evelina Alarcón, of San Fernando Valley. More than 250 labor, peace, civil rights and political leaders greeted South African Communist Party leader Chris Hani at his April 27, appearance in Los Angeles. The crowd contributed more than $12,000 towards the People's Weekly World fund drive and the work of the South African Communist Party. Los Angeles City Council member Robert Farrell, presented Hani with a resolution signed by Mayor Tom Bradley and City Council president John Ferraro, welcoming him as "one of the most highly respected and powerful voices of the anti Apartheid movement." The welcoming committee included reps Maxine Waters, Mervyn Dymally and Matthew Martinez, State senator Diane Watson, Los Angeles School board president Jackie Goldberg and more than 30 labor, civic and entertainment leaders including Cesar Chavez of the United Farmworkers. Waters sent a letter of greeting to Hani and Yengeni saying, "as the struggle within South Africa continues to develop from one stage to the next, please be assured that all of us will continue to be at your side. Your struggle is our struggle". Evelina Alarcon, chair of the Southern California district of the Communist Party USA, introduced Hani, She drew rousing cheers as she pledged, on behalf of the audience and the welcoming committee, continued efforts to maintain sanctions against South Africa. In June 1996 the Communist Party USA paper People's Weekly World held a tribute event in Los Angeles for unionists Jerry Acosta and Gilbert Cedillo. In 1995 Evelina Alarcon was chair of the Southern California District of the Communist Party USA and Secretary of its National Mexican American Equality Commission. As at April 1995, she served as secretary for the National Committee of the party. In 1998 Evelina Alarcon was the 48 year old chairman of the Communist Party USA Southern California District. 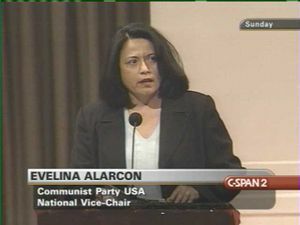 Evelina Alarcon has held several senior positions in the Communist Party USA, including Secretary of its National Mexican American Equality Commission. In 1997, Evelina Alarcon was the new national Communist Party co-ordinator for the Martinez Jobs Bill. On November 6 1999, a rally was held in Los Angeles, at Placita Olvera kiosk, calling for a holiday to mark the birth of Cesar Chavez. Contact for the rally was Evelina Alarcon of the United Farm Workers and the Communist Party USA. Speakers included Dolores Huerta of the UFW, and Majority leader of the California State Senate, Richard Alarcon, who introduced Senate Bill-984, which would make March 31, Chavez's birthday a paid public holiday. Also speaking were Los Angeles Board of Supervisors member Gloria Molina, who introduced a similar measure at county level, Art Pulaski, of the California State Federation of Labor executive, Los Angeles City Council member Jackie Goldberg, Los Angeles Federation of Labor executive member Miguel Contreras, and Paul Chavez, son of Cesar, and president of the National Farm Worker Service Center. The 2000 banquet, held October 28 at the House of Fortune restaurant featured Congressman Danny Davis as guest speaker. Alice Bush, director District 1199, SEIU Local and leader of last summer's strike against Methodist Hospital in Gary Indiana. Bea Lumpkin, author of "Always bring a crowd"
Jesus Garcia, former member of the Illinois State Legislature and presently director of the Little Village Community Development Center. A special award went to Evelina Alarcon, co-ordinator to the Cesar E. Chavez Holiday Campaign. Lance Cohn was a banquet organizer. On March 30 2002 the Communist Party USA paper People’s Weekly World called for a national holiday in honor of late Farm Workers Union leader Cesar Chavez. The article was followed by a long list of endorsersincluding Evelina Alarcon, Almost all endorsers were confirmed members of the Communist Party USA. On August 18th, the state of California recognized that legacy when Governor Gray Davis signed into law the creation of an official state holiday which will be celebrated starting in 2001 on Cesar Chavez’s birthday March 31st. Also established will be a Cesar Chavez day of learning and service in the state’s public schools where the state’s youth will be taught about Cesar and his union. Our participation has opened many formerly closed doors. The California leaders who agreed to my being the public leader and state coordinator of the Cesar Chavez holiday campaign are prominent statewide and even national leaders. Most of them know that I am a Communist. Has this built the Party's influence? Yes. Has it built the Party's credibility? Yes. Is it opening new doors to us in other areas of labor and people's movements? Yes. In March 2008, Presidential candidate Barack Obama sent a message of support to the Communist Party USA controlled Cesar E. Chavez National Holiday organization. "Chavez left a legacy as an educator, environmentalist, and a civil rights leader. And his cause lives on. As farmworkers and laborers across America continue to struggle for fair treatment and fair wages, we find strength in what Cesar Chavez accomplished so many years ago. And we should honor him for what he's taught us about making America a stronger, more just, and more prosperous nation. That's why I support the call to make Cesar Chavez's birthday a national holiday. It's time to recognize the contributions of this American icon to the ongoing efforts to perfect our union." 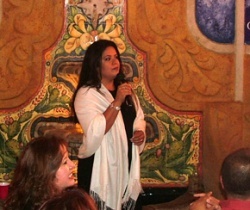 In June 2008, Communist Party USA leader and Executive Director of Cesar E. Chavez National Holiday, Evelina Alarcon presented a poster from the organization to Barack Obama's younger sister Maya Soetoro-Ng at a gathering in East Los Angeles. Clearly "designed to draw support to her brother’s presidential candidacy" from two key voting blocs—women and Latinos— the event was organized by State Senate Majority Leader Gloria Romero, State Senator Martha Escutia (ret. ), State Board of Equalization Chair Judy Chu, Los Angeles City Controller Laura Chick, Los Angeles City Councilmember Ed Reyes, and Los Angeles Unified School District Vice President Yolie Flores-Aguilar. This page was last modified on 9 April 2018, at 00:45.